It’s not uncommon for employees at Akron Children’s to go out of their way to help patient families, and these efforts can take many forms – even the form of an angel. 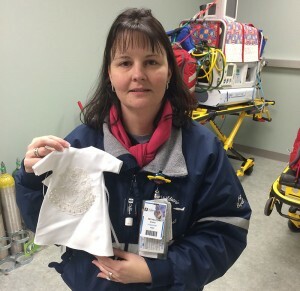 Michelle Myers, a paramedic at Akron Children’s Mahoning Valley, reached out to a Washington-based charitable organization to broker a heartwarming donation to help families going through the unimaginable experience of losing a child. 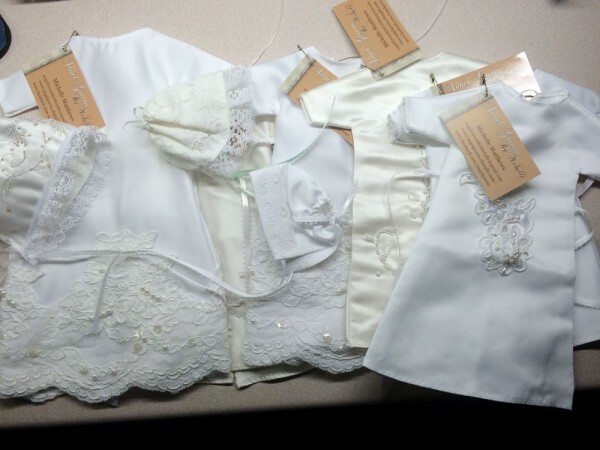 Myers contacted Michelle Matthews of “Angel Gowns by Michelle” last November, and within weeks the hospital received 25 gowns, caps and little wraps for micro-preemies. Most of the gowns aren’t much longer than a pencil. Matthews has been making these gowns after seeing first-hand while working in a NICU the grief parents go through after losing a newborn. The gowns are 100 percent donated, and intended to spare the parents the experience of heading out into “the happy world of baby shopping” in this time of grief for something small enough and special enough for their child. Myers presented the donation, hand-sewn with great detail by a team of volunteer seamstresses around the country, to the staff at Akron Children’s NICU located at St. Elizabeth Boardman Hospital. Angel Gowns by Michelle committed to send another shipment whenever they’re needed. A local sewing group is being established to make the angel gowns. Contact Marie at marieaparker@aol.com if you are interested in helping.